The two shot hole borers are nearly identical in appearance, and both have a symbiotic relationship with several pathogenic fungi. The female borers lay eggs which introduces fungi into trees. The fungi grow and provide food for larvae, which tunnel through the tree. This disrupts the flow of water and nutrients and causes branch dieback, canopy loss, and eventually tree mortality. Dead or declining trees may cause public safety hazards from falling limbs, increased fire danger, and increased risk of flooding due to blocked waterways. Dying and dead trees also decrease property value, and result in habitat loss for endangered birds and other wildlife. Prevent the spread of these damaging pests in several ways. Buy it Where You Burn It. 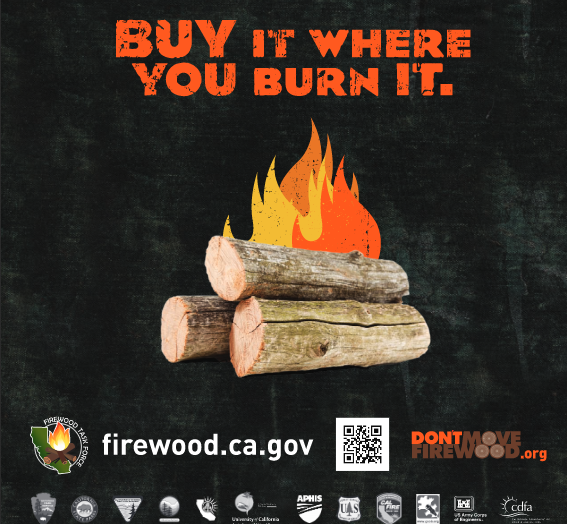 Buy firewood in the same county where you plan to burn it. Leave wood at home when visiting a park or going camping. Purchase and use wood from local sources for both home heating and outdoor recreation. 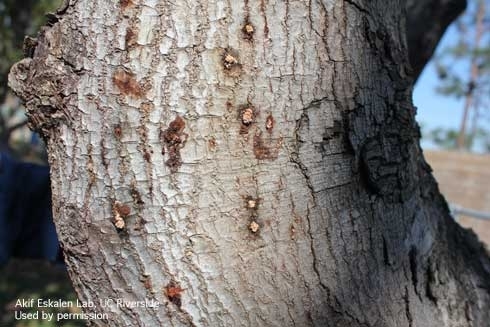 To learn more about these borers and the diseases they carry, read the leaflet A Devastating Threat to California Trees and visit UC ANR webpage on Invasive Shot Hole Borers.